American voting hasn’t had a major technology refresh since the early 2000s, in the aftermath of the Florida recount and the passage of the 2002 Help America Vote Act, which infused billions of dollars into American elections. More recent upgrades, such as poll books that could be accessed via computer, were supposed to reduce bottlenecks at check-ins — but they repeatedly failed on Tuesday, worsening waits in Georgia, South Carolina and Indiana. While aging infrastructure was already a well-known problem to election administrators, the surge of voters experiencing ordinary glitches led to extraordinarily long waits, sometimes stretching over hours. From Pennsylvania to Georgia to Arizona and Michigan, polling places started the day with broken machines leading to long lines, and never recovered. 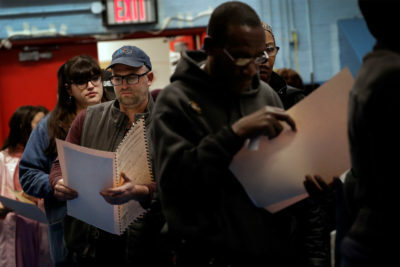 “We think we can solve all of these voting problems by adding technology, but you have to have a contingency plan for when each of these pieces fail,” said Joseph Lorenzo Hall, the chief technologist at the Center for Democracy & Technology in Washington, D.C. It appears many of the places that saw electronic poll book failures had no viable backup system. Hall said that problems with machines and computers force election administrators to become technicians on the spot, despite their lack of training. This exacerbates problems: Poll workers aren’t able to accurately or efficiently report issues to their central offices, leading to delays in dispatches of appropriate equipment or staff. Perhaps the most embarrassing technological faceplant was in New York City, where the machines used to scan ballots proved no match for wet weather. Humidity caused the scanners to malfunction, leading to outages and long lines. The breakdowns proliferated up and down the East Coast. Humidity also roiled scanners in North Carolina. In Charleston, South Carolina, an interminable delay driven by a downed voting system drove one person to leave for work before she could cast her ballot. “It felt like a type of disenfranchisement,” she told ProPublica. Voting machine outages in some Georgia precincts stranded voters in hourslong lines. In predominantly black sections of St. Petersburg, Florida, wait times ballooned as voting machines froze. Some of the pressure on the aging technology was relieved by early and mail-in voting, so that everyone didn’t have to vote on the same day, Grayson said. But many states still require people to cast their ballots on Election Day, and others have added time-consuming procedures such as strict ID requirements. Those sorts of security measures add their own layers of confusion. Many voters reported never receiving their ballots in the mail. Georgia voter Shelley Martin couldn’t vote because her ballot was mailed to the wrong address — even though she filled out her address correctly, the county election office accidentally changed a 9 to a 0. In Ohio, some in-person voters were incorrectly told they had already received an absentee ballot, because of a computer error. When people show up at the wrong polling place or have problems with their registration, they are usually entitled to cast a provisional ballot that will be counted once it’s verified. But these problems were so common on Tuesday that some locations ran out of provisional ballots and turned people away, according to North Carolina voters’ reports to ProPublica. In Arizona, some voters were told they couldn’t have provisional ballots because of broken printers. In Pennsylvania, some college students encountered glitches with their registration and said poll workers wouldn’t give them provisional ballots. Administrative stumbling blocks and unhelpful election officials left some voters throughout the day scrambling to figure out where or how they were supposed to vote. Across the country, confusion over new laws and poll worker error forced voters to work with attorneys or drive long distances in an attempt to solve problems. In Missouri, a last-minute court ruling resulted in chaos across the state. Less than a month before, a judge radically altered the state’s voter ID law to allow more valid forms of identification. By then, poll workers had already been trained. Many enforced the incorrect version of the law. In St. Charles County, northwest of St. Louis, voters across the county reported that poll workers openly argued with voters who showed identification allowed under the new ruling, demanding old forms of ID. By the end of the evening, the county had ignored demand letters from attorneys at Advancement Project, a civil rights group. Denise Lieberman, an attorney with the group, said it is considering legal remedies due to the county’s “flagrant disregard” for the judge’s ruling. Rich Chrismer, the director of elections for the county, said he never saw the letters — he was at polling places all day. By late morning, he’d been made aware of 12 different polling locations where poll workers were giving incorrect instructions. He utilized the local police to distribute memos to all 121 polling locations, correcting poll worker instructions. They were distributed by the late morning, and complaints dropped off after that, he said. Chrismer said training had already happened by the time the judge issued his ruling, but that he’d put new instructions in “four different places” in the packet mailed to poll workers ahead of the election. “They were either ignoring me or they didn’t know how to read, which upsets me,” he said. Dallas County Clerk Stephanie Hendricks expressed similar frustration at the short window of time allowed by the court to retrain poll workers, update signs and ensure voter understanding. Hendricks said the small county had to “scrape the bottom of the barrel” for poll workers, who only received 90 minutes of training. This, combined with the very short notice for the legal change, made it difficult to help poll workers understand the law. “The last few elections it’s been photo ID, photo ID, photo ID, and now all of a sudden the brakes have been thrown on. It’s confusing for people,” she said. The frustrations for Chris Sears began on Friday, when he turned up to cast an early ballot at Cinco Ranch Public Library, a brick building abutting a duck pond in the suburbs west of Houston. Sears, a 43-year-old Texan who works in real estate, had voted at the library in the 2016 election, after moving to the area from adjoining Harris County a year earlier. Now, at the library, poll workers couldn’t find him in their rolls. His only recourse, they told him, was to drive the half hour or so to the Fort Bend County election office. Sears, realizing he wouldn’t make it there and back before early voting closed, decided to go first thing Tuesday morning. After he explained his situation and presented his driver’s license, which had a local address, the clerk at the election office had a terse message for him. She slid a fresh voter registration application across the counter and told him: “Fill this out, and you’ll be eligible to vote in the next election.” Sears told the clerk he hadn’t moved, and that he’d voted in the last election. Sears wasn’t alone. As he went back and forth with the clerk, three other men who, like Sears, had moved recently from other Texas counties, came in with near-identical complaints. The clerk gave them the same response she had given Sears. County officials told ProPublica they all should have been offered provisional ballots — not sent across town or told to register again. Ultimately, Sears would cast a provisional ballot, but he didn’t discover this option until he’d done hours of research to try and hunt down the cause of his problems. Some administrative problems were a bit more bizarre — a polling place in Chandler, Arizona, was foreclosed upon overnight. Voter Joann Swain arrived at the Golf Academy of America, which housed the poll, to find TV news crews and a crowd of people in the parking lot of the type of faux Spanish Mission Revival shopping centers that fleck the desert around Phoenix. Voting booths were arrayed along the sidewalk. 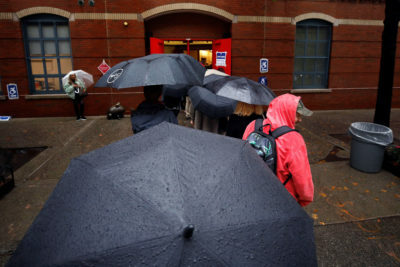 There was almost 100 percent humidity and unusually high precipitation in the five boroughs, not exactly perfect for a widely used ballot scanner. According to its technical documents, the scanner becomes downright uncomfortable when the weather turns sweaty. Swain, who is 47, waited in line for two hours as poll workers promised the machines necessary for voters to print and cast their ballot were on their way from Phoenix. She didn’t want to cast a provisional ballot, for fear it wouldn’t be counted. One man in line who took poll workers up on an alternative to waiting — voting at Chandler City Hall — returned not long after he left. With polling site difficulties cropping up throughout the Phoenix area, he hadn’t been able to vote there either. To the puzzlement of voters waiting in line, Maricopa County Recorder Adrian Fontes tweeted that the Golf Academy polling place was open. “No it’s not. I’m here,” an Arizonan named Gary Taylor shot back. Swain ultimately left at 8:30 a.m. By the time she returned, later in the day, poll workers had set up the voting machines delivered from Phoenix in another storefront in the shopping center. The original machines remained locked in the Golf Academy, she said. Back East, reports of potentially improper political messages at polling sites had begun to crop up, and the response from election officials highlighted the at times flimsy nature of electioneering laws. On Tuesday morning, a handwritten sign appeared on the door of a polling station near downtown Pittsburgh, which read “Vote Straight Democrat.” County election officials were alerted to the sign in the early afternoon, but by then the sign had been removed, Amie Downs, an Allegheny County spokeswoman, said in a statement. An official in the county election office, who declined to give her name, blamed the sign on a member of the local Democratic Party committee. “He said he does that every year but never had problems till this year,” she said. Pennsylvania law prohibits electioneering within 10 feet of a polling place, and Downs said it wasn’t clear whether the sign violated the law. Down the coast, in New Port Richey — a politically mixed cluster of strip malls northwest of Tampa, Florida — Pastor Al Carlisle triggered upward of 75 complaints to Pasco County election officials after he put up a handwritten sign reading “Don’t Vote for Democrats on Tuesday and Sing ‘Oh How I Love Jesus’ on Sunday” outside his church. That wouldn’t be a problem, except that on Election Day, his church doubles as a polling place. Carlisle remained unrepentant. He continued Wednesday to trumpet the sign on his Facebook page, mixed among posts conflating religious faith with support for President Donald Trump. Local election officials, however, stopped at mild censure. Pasco County election chief Brian Corley told the Tampa Bay Times the sign was “not appropriate” but legal, since Carlisle had placed it only just more than 100 feet away from where voters were casting their ballot. Later in the day, some voters complained about large posters opposing abortion — an example: “God Doesn’t Make Mistakes, Choose Life” — plastered on the walls of a church gymnasium in Holts Summit, Missouri, used as a polling place. Despite the political implications, election officials told local radio station KBIA that the posters were legal because there were no abortion-related issues on the ballot. Behind the scenes, officials nationwide were addressing gaps in website reliability and security. In Kentucky, a handful of county websites that provided information to voters flickered offline for parts of the day. State officials said the issue was likely a technical problem not caused by a malicious attack. But several states meanwhile alerted U.S. election-security officials to efforts of hackers scanning their computer systems for software vulnerabilities. Days before the election, a county clerk’s office said its email account was compromised and its messages forwarded to a private Gmail address, according to person familiar with the matter who was not authorized to discuss it publicly. Down the coast, in Broward County, Florida, just north of Miami, election officials were struggling with a technical failure of a different sort. Seven precincts were unable to transmit vote tallies electronically. This time, it would force election officials to internalize what voters had suffered throughout much of the day. 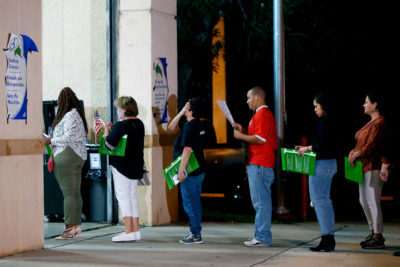 Around 11 p.m., they walked out into the balmy South Florida night, got into their cars and drove the voter files to the county election office. Ariam Alula, Maya Miller, Blake Paterson, Linley Sanders, Ariana Tobin and Jack Gillum contributed to this report.